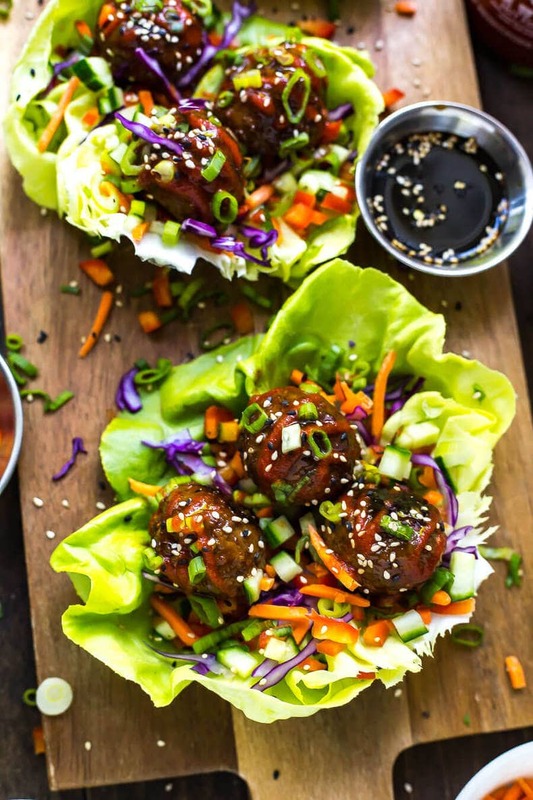 These Asian-inspired Sticky Sriracha Meatball Lettuce Wraps are a super easy low carb dinner that come together in 30-minutes – plus the meatballs are freezer-friendly! Say hello to the easiest Monday night dinner ever, seriously. 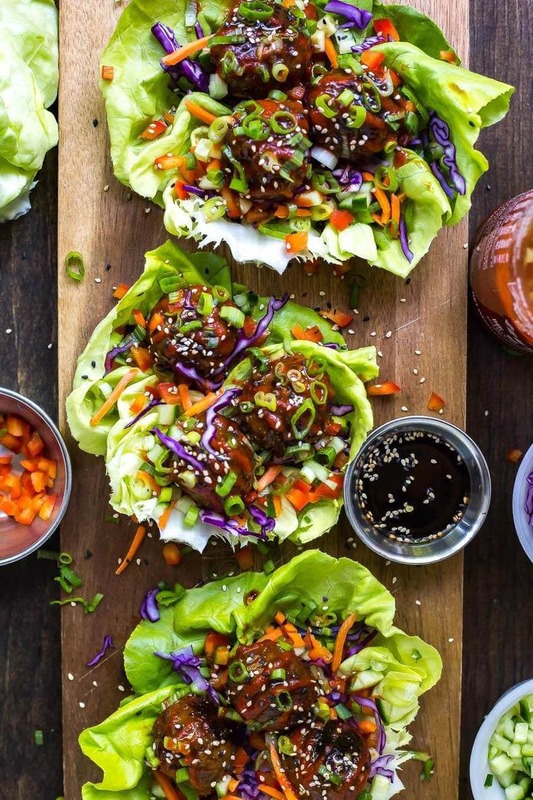 These Sticky Sriracha Meatball Lettuce Wraps are the bomb, and basically take no time to make. But even if you are running really, REALLY short on time, some make-ahead, freezer-friendly meatballs certainly wouldn't hurt to have on hand for busy weeknights. Whenever I've got an especially busy week (or let's say I've done four photoshoots in a day and absolutely trashed my kitchen and spent two hours doing dishes so I'm TOTALLY done with cooking for the day…) I always take a peek in my freezer to see what I've got going on food-wise. It's honestly such a smart thing to do: to have some lazy-girl hacks on hand for when you really just don't feel like cooking, but you're also simultaneously too tired to even go get takeout. And don't even talk to me about those takeout delivery services like Foodora or Skip the Dishes or Uber Eats, because that ish is expensive. Nobody has $50 on hand for your boring old weeknight dinner. So I urge you, head on over to the freezer! Some of my fave meals are freezer-friendly, like these Meal Prep Breakfast Taquitos or this African-Inspired Peanut Stew. 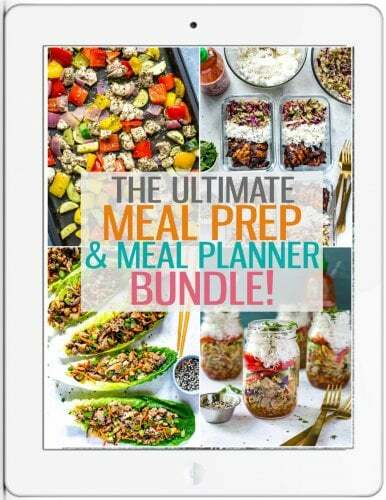 These meals totally save me after a long day, and they certainly help me start the work day off right. 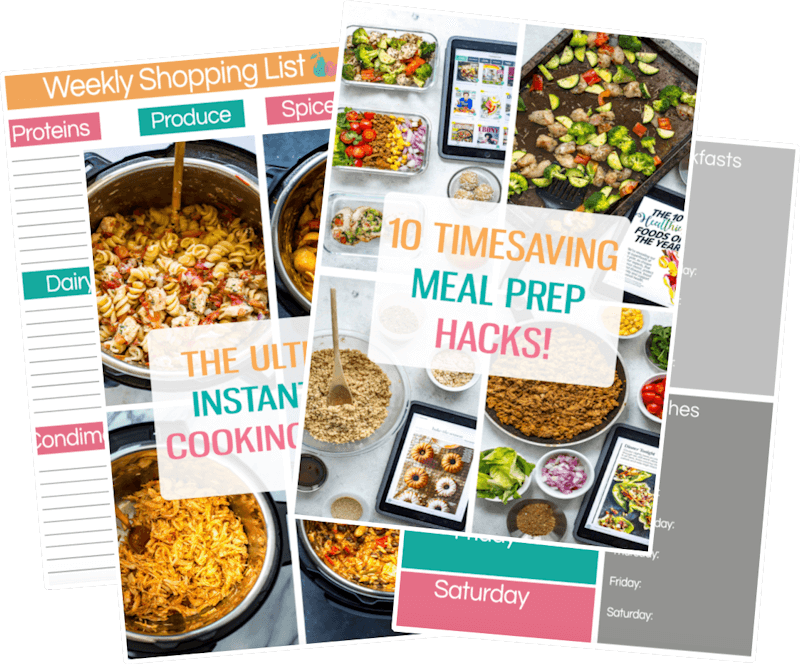 That's another reason I frequently skip takeout and save it for the weekend – there's nothing better than food that's going to nourish you and keep you going so you feel great all day and energized enough to power through even the toughest situations. Life just feels a little bit easier when you have the energy and enthusiasm for it! 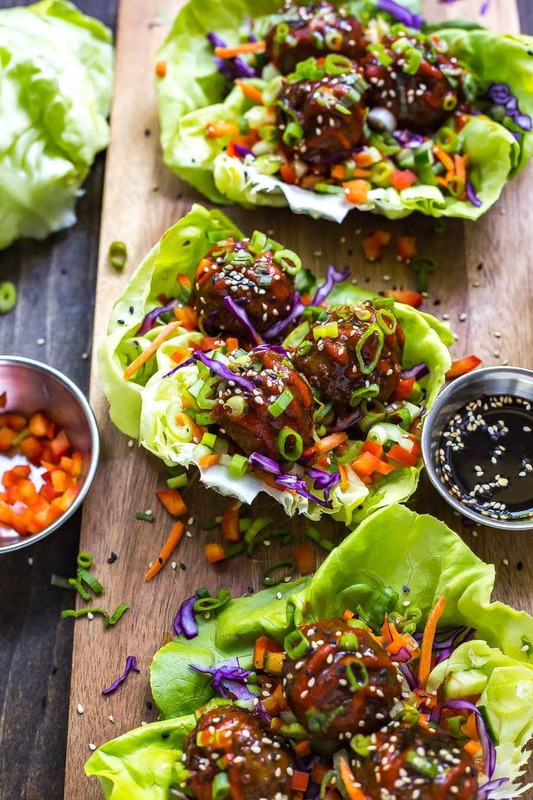 Now let's get into the nitty gritty details on these Sticky Sriracha Meatball Lettuce Wraps. They're a clear-out-your-produce-drawer type of meal. Dump ALL the veggies up in here, preferably all chopped up so you get a ton of flavour in every bite. Make up the super simple sriracha-honey sauce while the meatballs are cooking on the stove or while you're warming them up in the microwave. I should also mention that these Sticky Sriracha Meatballs are versatile enough to use in just about any recipe. 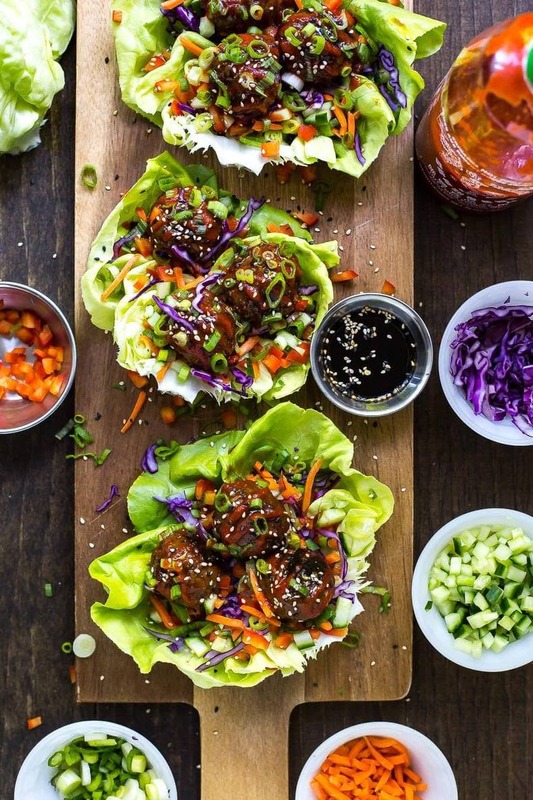 When I'm craving these lettuce wraps, I'll pull 4 or 5 meatballs out of the freezer and add them to two or three lettuce wraps and make the sauce while I'm preparing the veggies, but you can also use these meatballs for last minute spaghetti dinners or even in stir fries or noodle bowls. The flavours of the meatballs themselves are low-key enough to pair with anything but still incredibly delicious and moist and everything a meatball should be. You can also make them with ground turkey or chicken if you're looking for a lower-calorie alternative to ground beef. 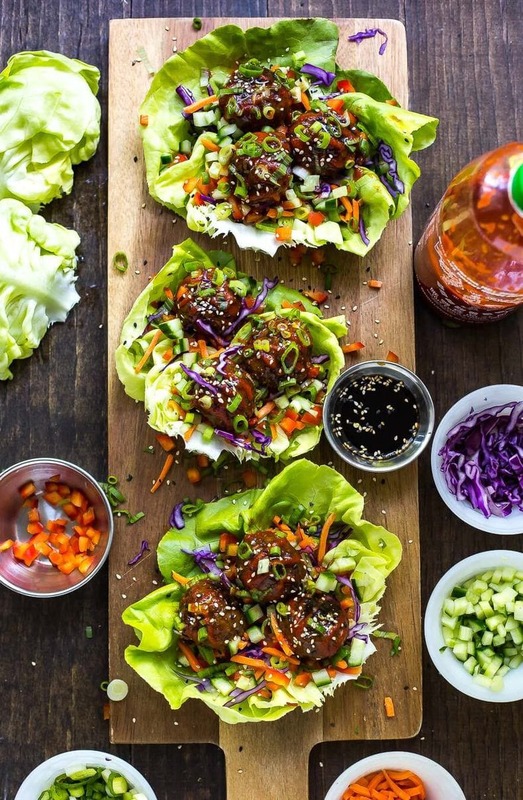 Will you be making these Sticky Sriracha Meatball Lettuce Wraps? I think these wraps would also be perfect for your weekly meal prep! Boston leaf lettuce usually holds up fairly well as long as you pack the leaves separately and assemble everything at work. Stack the lettuce leaves, separate the veggies and the meatballs (with sauce already on top) and then enjoy on-the-go. Maybe take a fork though…these could get messy LOL! 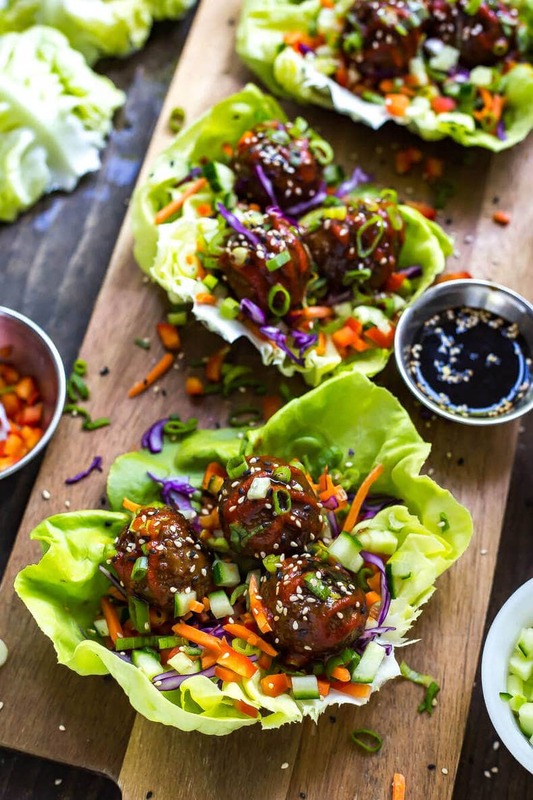 These Asian-inspired Sticky Sriracha Meatball Lettuce Wraps are a super easy low carb dinner that come together in 30-minutes - plus the meatballs are freezer-friendly! In a large bowl, mix all ingredients together for meatballs and roll into 1-inch sized balls. Heat 1 tbsp olive oil in a large frying pan, then add meatballs and cook for 7-8 minutes until browned and fully cooked. Set aside or freeze for later, reheating for 2-3 min in the microwave as needed. Meanwhile, prepare veggies, adding to lettuce leaves. If serving meatballs right away, mix together ingredients for sauce in a large bowl, then toss cooked meatballs in sauce. 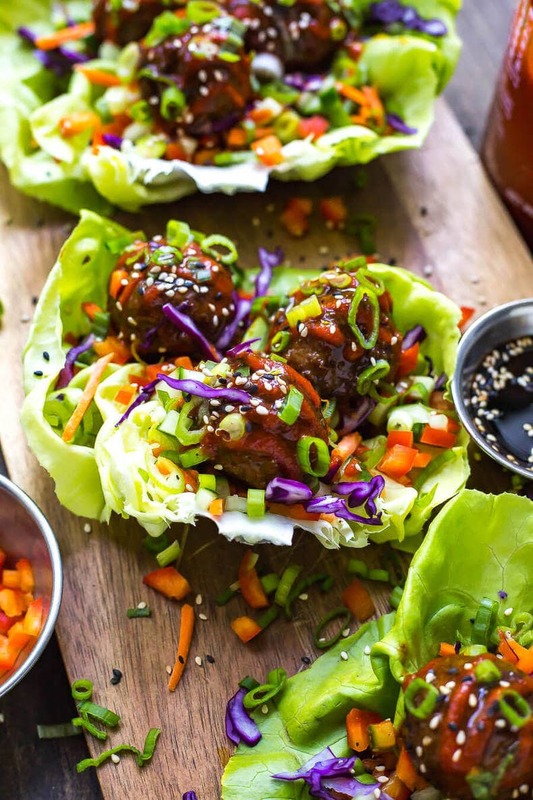 Top lettuce wraps with 2-3 meatballs each and serve with extra sriracha and soy sauce. Enjoy! Yay!!! So happy to hear that Christine 🙂 Thanks for sharing with me! I never comment on recipes… but I just wanted to let you know I literally have dreams about these meatballs. THEY ARE SO GOOD. Hahahaha aww THANK YOU Ashton!!! 🙂 So glad you love them so much!!!!! !